Just because Samsung has been tight lipped on their Android 4.3 plans for devices like the Samsung Galaxy S4 doesn’t mean they aren’t working on the update. In fact, it was during IFA 2013 that a Samsung rep was quoted as saying Android 4.3 would be rolling out to the S4 and S3 in October. It wasn’t until a few days ago that we saw further confirmation through a leaked Samsung slide showing October for the S4 (as well as S3 and Note 2 in November). 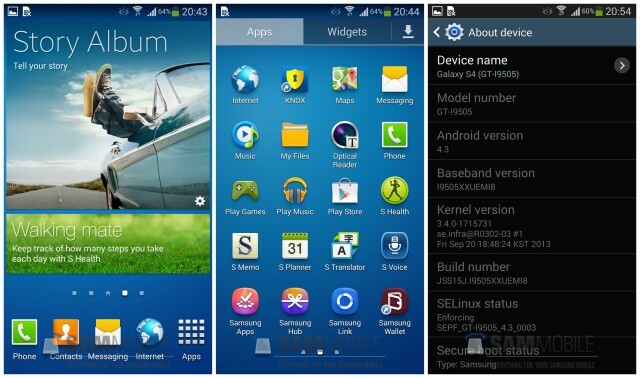 Here we are in October, and as Samsung patches up the final builds for the S4′s final Jelly Bean update, a leaked test build has just been picked up by the boys at SamMobile. Build number has leaked out for the international Samsung Galaxy S4 (GT-I9505), so we don’t recommend flashing if you own the Snapdragon 600 model. We’re sure the boys over on XDA are busy porting this to other devices as we speak. Changes in the leaked build include Samsung Knox, and Samsung Wallet (although S Wallet is currently disabled), a new Reading Mode that’s only available for specific apps, an improved Samsung keyboard, and minor UI changes. SamMobile says color reproduction has also been improved and that text is now “sharper than ever”. So, take that as you will. Sounds like it wont be much longer before Samsung makes 4.3 official for the S4, of course, those of us in the US citizens need to take into account our carrier middle-men delaying things a bit.